There's no better vegetable for summer than a grilled asparagus recipe. Simple and delicious, a grilled asparagus recipe goes with all kinds of summer fare - from burgers to ribs. If at all possible, choose spears individually rather than bunched together so that you can select the freshest spears available. If you aren't going to eat your asparagus right away, wrap the butts of the spears in a damp paper towel. Place the spears in a plastic bag and refrigerate. Because asparagus contains sugars that begin to turn to starch as soon as the spears are harvested, it is best to prepare your grilled asparagus recipe as soon as possible. This preserves maximum flavor and tenderness. 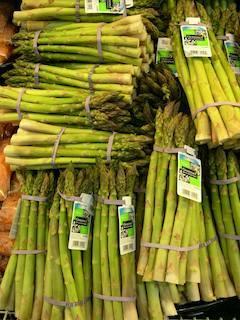 If you don't plan to eat the asparagus right away, you may want to blanch the spears lightly, put them in a sealed plastic bag, and freeze them until you are ready to serve. While the frozen asparagus is never as good as fresh, this method preserves the flavor as much as possible. Before making grilled asparagus, wash the spears thoroughly and then snap off the fibrous butts. To do this, lightly bend the spear and let the asparagus snap at its natural point. The butts of the asparagus are flavorful - just tough and fibrous, so they can be saved and used in vegetable stocks. This is a simple recipe that honors the flavor of the fresh asparagus. When preparing the grilled asparagus, try to select spears with roughly the same thickness in the stalk so that they cook evenly. If you are worried about losing spears in the grate, you can skewer the spears perpendicularly to the skewers, with a few spears on each skewer. You can also use a grill basket to protect the spears. Toss the asparagus spears with the olive oil. Sprinkle the spears with salt and pepper. Grill the asparagus over high heat for a few minutes, until tender. Fresh asparagus usually reaches tenderness in two to three minutes. You may also marinate the asparagus for even more flavor. Prepare the asparagus as directed in the preparation section of this article. Place the asparagus in a single layer in glass pan with sides. Mix together the remaining ingredients and pour them over the asparagus. Marinate the asparagus for one hour, turning the spears frequently. Remove the asparagus from the marinade and grill on skewers or in a grill basket over high heat, about two to three minutes. Grilled asparagus is a simple, delicious spring and summer recipe. Try it with grilled salmon, beef ribs, or burgers for an easy, fresh summer supper.